Summary: Doomed to work his summer away in the Lost and Found Department of the Toronto Transit Commission, Duncan is passing his time sorting the odds and ends that come in from buses, subway trains and streetcars. Just when he thinks things couldn’t possibly get more boring, Duncan comes across a journal written by a man detailing his acceleration from killing animals and starting fires to stalking women he is planning to kill. Haunted by the drowning death of a girl he feels responsible for, Duncan is determined to do something to protect the women in this would-be killer’s sights. When the police don’t take Duncan’s concerns seriously, it is up to him and his friend Vinny to figure out the journal writer’s identity and stop him from acting on his plans. Review: In this thriller-type read, Graham McNamee eases serious themes of death, murder and abuse with wonderful moments of laugh out loud humour. I wish there had been a bit more development around the death Duncan witnessed, because by the end of the book I still didn’t quite understand why exactly he thought he was solely responsible for not getting to her in time. My favourite character was Vinny because I loved his imaginative and varied responses to questions about his birth defect. He’s a smart character who helps Duncan as needed; finding a friend who accepts him the way he is. Duncan himself is a close second favourite. He seems to put people at ease and allow them to be who they are without judgement or pressure. I enjoyed McNamee’s depth when it came to Duncan’s grief, as well as all of the information he provides about profiling serial killers as Duncan and Vinny are trying to figure out how to identify the author of the journal. I was wrapped up in the flow of the story but I learned a lot at the same time. McNamee introduces his reader to the darkness of the human mind without overwhelming them. 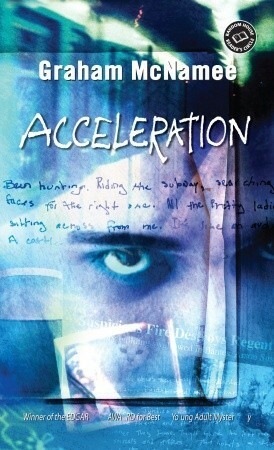 It is a bit remarkable that two teens could track down a potential murderer without police aid, not to mention dangerous, but Acceleration was a well-paced, spine-tingling read that I would recommend to young teen readers. Acceleration by Graham McNamee is published by Wendy Lamb Books, (2003).